ARLINGTON — A Metro station closure, rain, a holiday weekend and confusion about space for shuttle buses were among the contributors to Friday’s terrible traffic around Reagan National that rippled across Arlington, Alexandria, D.C. and beyond, Metropolitan Washington Airports Authority leaders said Wednesday. Airports Authority CEO Jack Potter called it “an extreme traffic jam,” but argued it was not caused by construction on airport property that is expected to last through the end of next year. While Potter said the airport had more than 40,000 passengers, Metro spokesman Dan Stessel said the Friday of Veterans Day weekend last year actually saw some of the lightest ridership at the airport station of the entire October to December time period. Only the Friday after Thanksgiving and the Friday between Christmas and New Year’s saw lighter ridership at the airport last year, Stessel said in an email. Metro had originally announced the four-day closure last winter for the week before Veterans Day weekend, but in late September shifted it later. “We shifted the schedule by a week to reduce the number of commuting days impacted from two to one,” Stessel said. Still, Potter said the closure “couldn’t have happened at a worse time,” since the extra people in cars and rough weather led to major issues. “Absolute gridlock. It wasn’t a matter of there was traffic on the airport, you couldn’t get to the airport, and if you were on the airport, you couldn’t get off the airport,” Potter acknowledged. In the future, Potter hopes to get more car lanes going off the airport into Crystal City and/or onto the George Washington Parkway, possibly as something folded into improvements promised to Amazon. Today, there is one lane exiting onto the G.W. Parkway each way plus a bridge with two lanes to Crystal City. “We’re sorry for what happened, we beg your indulgence, we’re going to work very hard to make sure it doesn’t happen again. The fact that we had a few lane closures on the airport, that wasn’t the reason for what happened here. It was the Metro and, again, we’re reminded of just how important it is and how careful we have to plan for the upgrades in the infrastructure that they have underway,” Potter said. A project manager acknowledged that the construction closures in place Friday did cause traffic issues though. Richard Golinowski said that the impact of the latest round of closures on the upper, ticketing level roadway were compounded by bad weather. Like previous closures, it would take at least a day of changes until the minimum impact on traffic flow was figured out, and in this case that meant shortening the closure zone. At first, they had set up a longer closure of two lanes in the hopes that an earlier merge could reduce traffic backups. Instead, with no work being done Friday due to the rain but construction materials already staged, there were additional delays. 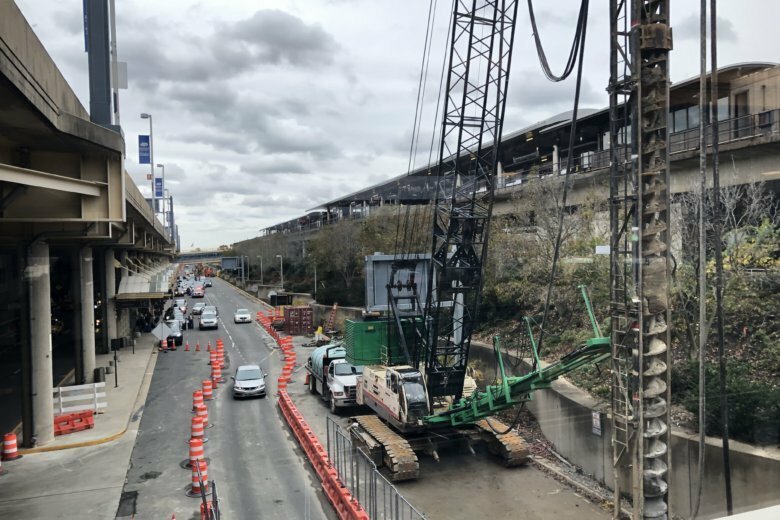 Eventually, the closure zone was shortened to open up more lanes to drop offs, pickups and traffic and the work was done Saturday, Sunday and Monday. Delays were exacerbated by people tapping the brakes at the end of the closure where there was a very short stretch to figure out which way to go: back to the airport or out to G.W. Parkway. Near the Metro station, there were separate issues Friday as thousands of people waited in lines for shuttle buses that seemed to be taking forever. “One of the biggest challenges in this area was we had the buses who were moving our customers and WMATA’s customers, but we also had a lot of rail maintenance traffic in here trying to get to the station so they could get up there and work,” Golinowski said. “So there was a lot of debate back and forth between the rail side of the house and the bus side of the house about who actually had the space to use. We got through that over the first day and it all settled out and the rail people realized they couldn’t use that spot anymore and it was all reserved for busing,” he said. There were lines at other times during the four-day closure, but nothing like what was seen Friday. Former Arlington County Board member Walter Tejada, now on the Airports Authority Board, called the total traffic mess “an epic event,” and hopes promises it won’t happen again will actually be kept. Former Fairfax County Board of Supervisors Chairman Kate Hanley, also on the Airports Authority Board, wants the authority to be more involved in Metro’s shutdown planning process. “We have some idea of when our passengers are leaving,” she said. She hopes there is no similar work planned around other long weekends like Presidents Day. “Traffic’s terrible everywhere, but … those are not good weekends for Metro to close those stations. It may seem like good weekends for them because of Friday night traffic and Monday morning traffic, but it’s not good weekends for most of the passengers that are riding to the airport,” she said. A Yellow Line shutdown begins the day after Thanksgiving weekend, but all stations will remain open. Traffic at Dulles is not always perfect either, and the Airports Authority is looking into improvements there that could be implemented once the Silver Line extension opens around 2020. Executive Vice President Margaret McKeough said peak travel season starts this week, and continues through the end of the year. She promised the authority will be focused on helping people get in and out of town and in and out of the airports in a timely way.